There is a new field type named Geolocation in SharePoint 2013, which allows us to easily integrate location and map functionality into SharePoint lists. However this field is not available for the end user to choose in Create Column window. It must be added through code. PowerShell is one option. Here I use a Site Column and a Content Type and then use an Element to bind it to the pages library. 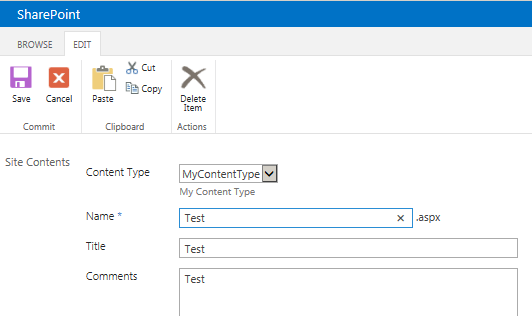 First, deploy above elements with a feature and then, create a page using “MyContentType” content type. Then select the Edit Properties option of the created Page item. 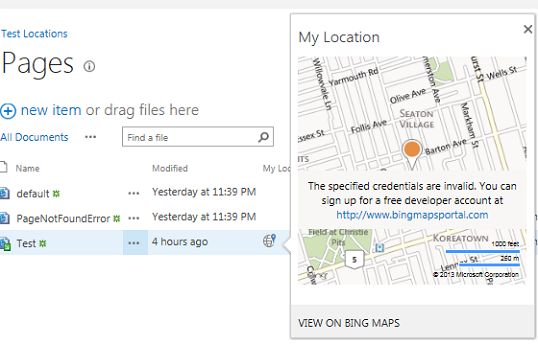 My location filed will be displayed in the edit properties window as follows. In there we have two options to provide the location details. That is either by specifying the location coordinates (Longitude and Latitude) or by using the current location (my location). Selecting current location option will make a client-side call to determine location based on the IP information of the device making the call. It does not require GPS. 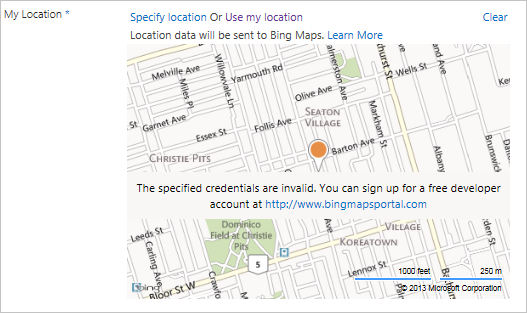 Once the list item is saved, we can see a globe symbol for the location and by clicking on it, we can see the Bing map view for the location with scroll and zoom features. In addition there is a new view template provided for creating custom Map Views for the lists. More information on Geolocation field in MDSN is here.